Sapphire introduces the Radeon R9 295X2 OC Limited Edition, this card features a 1030MHz core and 8GB GDDR5 memory clocked at 5200MHz. For comparison, the stock model has a 1018MHz core and 5000MHz memory. 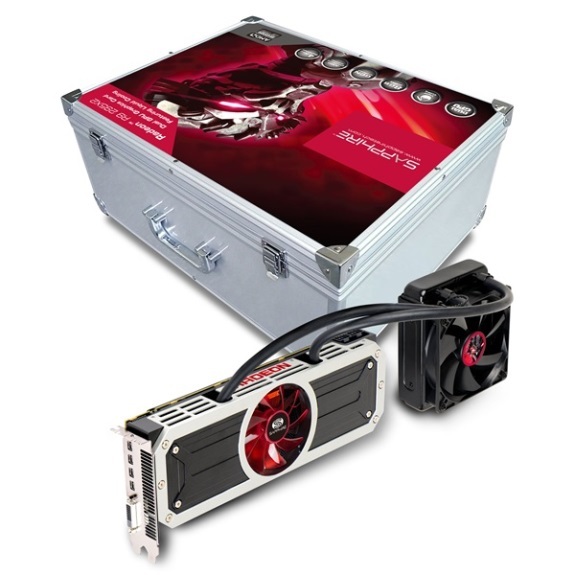 SAPPHIRE Technology, a leading manufacturer and global supplier of AMD-based graphics products has just announced that it is now shipping the fastest and most powerful graphics cards available to date – the SAPPHIRE R9 295X2 and SAPPHIRE R9 265X2 OC. Both models combine two AMD Radeon R9 Series GPUs featuring the successful AMD Graphics Core Next (GCN) architecture in a single card design to deliver breakthrough performance in graphics benchmarks and in gaming, even at maximum settings and in ultra-high resolutions such as those supported by the latest 4K monitors or multi-screen setups. Both SAPPHIRE R9 295X2 graphics cards come equipped with an advanced hybrid cooling solution that includes a closed-loop, pre-assembled and maintenance-free liquid cooling system. Developed jointly with AMD by Asetek, a leading provider and designer of PC liquid cooling products, this solution delivers cool temperatures, quiet operation and consistent performance even under demanding loads. In addition to support for the latest 4K monitors, the SAPPHIRE R9 295X2 can easily drive up to five high resolution monitors using AMD Eyefinity – a high resolution multi-display solution that is easy to set up and allows games or other applications to run across multiple monitors in a single logical surface (SLS). Complementing the high resolution visual display is AMD TrueAudio technology. The SAPPHIRE R9 295X2 features a dedicated audio processor to provide richer, more realistic and better spatially located soundscapes through any stereo output devices and delivering a more immersive gaming experience. The SAPPHIRE R9 295X2 is shipping now and is available worldwide.